So far in our bathroom remodeling blog series, we’ve explored ideas about how to hire the right company for a bathroom remodel. But, what about after you’ve hired them? 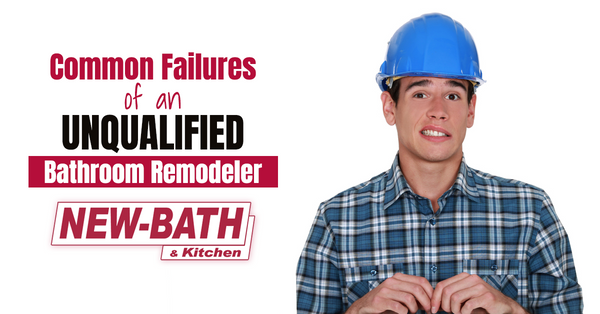 What are the signs of an unqualified bathroom remodeler? The sooner you know, the better! Getting your bathroom remodeled is an exciting way to improve your home, increase its value, and improve the way you enjoy the space. A simple renovation can make your bathroom into a place that you want to be every day. However, it’s important to make sure you’ve found a home improvement professional who can deliver your dream bath without breaking the bank - or your house. Here’s our list of the reflags of an unqualified bathroom remodeler. Any contractor will need to make a floor plan for your dream bathroom that explains how they will get the job done. Great bathroom remodeling companies know that they must get you to approve a design before they can do the work that they have offered. You can work together on a floor plan, but you must see that plan on paper before the work begins. If there’s no floor plan, it’s time to reevaluate the situation - before work begins. It’s important to ask bathroom remodeling contractors how they will vent the room. A bad contractor might not leave any ventilation in the room. Why is that important? Without an open window or vent fan, bathrooms are susceptible to excessive moisture buildup that increases the chances of causing damage to walls, floors, and ceilings. Even the bathroom fixtures can be affected. Warm, humid air, caused by running hot water for baths and showers, is a perfect environment for mold and mildew to grow. High moisture in rooms can also break down interior room materials such as wallboard, wall paint, and trim. For a safe, healthy bathroom, be sure your remodeler takes ventilation into consideration. Does your contractor want to rip out the tub? If your home’s resale value is important to you, there should be at least one bathtub in your home. The fact is, homes sell better with a tub in the bathroom. Remember, it is very hard to remove the tub only to put it back in the future. Instead you could consider having a walk in tub installed. A walk in tub is easier to use as you get older and can add value to your home. These products come with a lifetime warranty and, if you choose Toledo New Bath for your bathroom renovations, we can even offer you a warranty on the work. Bad tiling work is something that you may have to contend with when you work with a company that sends an unprofessional installation staff. You have to have the tile laid correctly so that it looks great, helps you keep the floors clean, and will remain in place with no trouble. Crooked tile can instantly decrease the value of your home. If your tile isn’t lining up, get your project manager involved right away. It seems like an obvious thing, but every surface in the room has to be level, from the floors to the walls. If things are looking tilted, stop the work and get a second option ASAP! The good news is, you can avoid all of these pitfalls by choosing Toledo New Bath as your preferred bathroom remodeler. We can help you lay out the whole room, send you a great bathroom remodeling professional, and give you the design you have always wanted. Get a FREE, no-obligation estimate so you know the costs involved before making a firm commitment. Our sales consultants would be happy to talk with you about your bathroom remodeling; visit one of our two local showrooms or give us a call today!